More than 95% percent of information on the web is in the form of written language. Optimizing typography is optimizing readability, accessibility, usability(! ), overall graphic balance. In other words: optimizing your typography also optimizes your user interface. 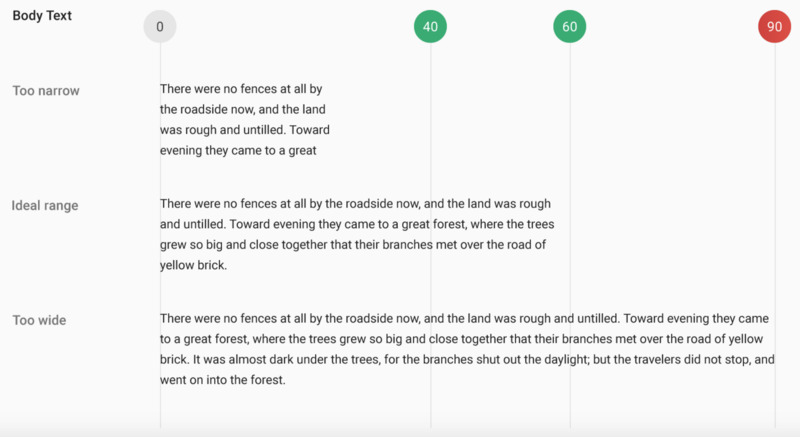 In this article, I will provide a set of rules that help you improve readability and legibility of your text content. Using more than 3 different fonts makes a website look unstructured and unprofessional. 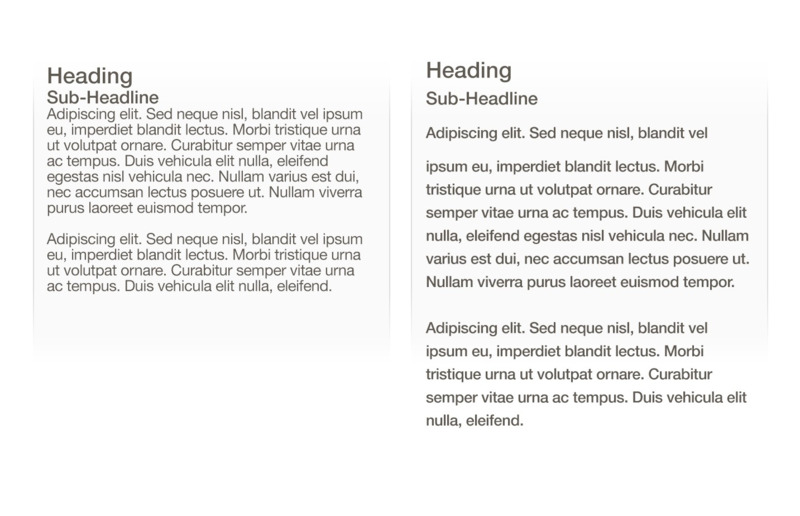 Keep in mind that too many type sizes and styles at once can also wreck any layout. 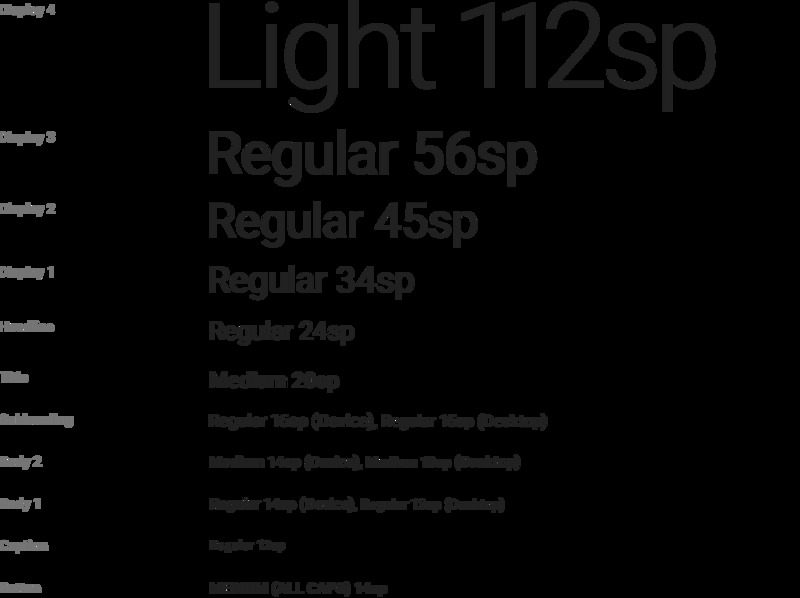 In general, limit the number of font families to a minimum (two is plenty, one is often sufficient) and stick to the same ones through the entire website. If you do use more than one font, ensure the font families complement each other based on their character width. Take the example of fonts combinations below. The combination of Georgia and Verdana (left) share similar values that creates a harmonious pairing. Compare that to the pairing of Baskerville and Impact (right) where the heavy weight of Impact vastly overshadows its serif counterpart. Generate the code and paste in your HTML document’s <Head>. Actually, this approach has one serious problem— users are more familiar with standard fonts and can thus read them faster. Unless your website has a compelling need for a custom font, such as for branding purposes or to create an immersive experience, it’s usually best to stick with the system fonts. The safe bet is to use a system font: Arial, Calibri, Trebuchet, etc. Keep in mind that good typography draws the reader to the content, not to the type itself. For mobile devices, you should go for 30–40 characters per line . 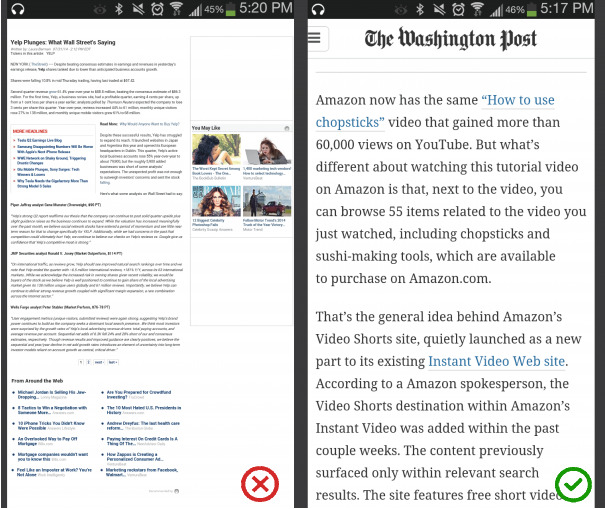 Below is an example of two sites viewed on a mobile device. The first one uses 50–75 characters per line (optimum number of characters per line for print and desktop), while the second one uses the optimal 30–40 characters. In web design you can achieve an optimal number of characters per line by restricting the width of your text blocks using em or pixels. Users will access your site from devices with different screen sizes and resolutions. Most user interfaces require text elements of various sizes (button copy, field labels, section headers, etc). It’s important to choose a typeface that works well in multiple sizes and weights to maintain readability and usability in every size. Make sure that the typeface you choose is legible on smaller screens! Try to avoid fonts that use cursive script, such as Vivaldi (in the example below): although they are beautiful, they are difficult to read. Many typefaces make it too easy to confuse similar letterforms, specifically with “i”s and “L”s (as seen in the image below), and poor letter spacing, such as when an “r” and “n” look like an “m”. So when choosing your type, be sure to check your type out in different contexts to make sure it won’t cause an issue for your users. All caps text — meaning text with all the letters cap­i­tal­ized — is fine in contexts that don’t involve reading (such as acronyms or logos), but when your message involves reading, don’t force your users to read all caps text. As mentioned by Miles Tinker, in his landmark work, Legibility of Print, all-capital print greatly retards the speed of scanning and reading in comparison with lower-case type. In typography, we have a special term for the spacing between two lines of text — leading (or line height). By increasing the leading, you increase the vertical white space between lines of text, generally improving readability in exchange for screen real estate. As a rule, leading should be about 30% more than the character height for good readability. Properly using white space between paragraphs has been proven to increase comprehension up to 20%, as pointed out by Dmitry Fadeyev. The skill of using white space lies in providing your users with a digestible amount of content, then stripping away extraneous details. These lines of text meet the color contrast ratio recommendations and are easy to read against their background colors. Once you’ve made your color choice, it’s absolutely necessary to test it out with real users on most devices. If any of the test show a problem with reading your copy, then you can be sure that your users’ll have exactly the same problem. Color blindness is a common condition, especially amongst men (8% of men are colour blind), it’s recommended to use other cues in addition to color to distinguish important information. Also avoid using red and green colors alone to convey information because red and green colour blindness is the most common form of colour blindness. Typography is a big deal. Making the right typography choices can give your website a feel of crispness and polish. Bad typography choices, on the other hand, are distracting and tend to call attention to themselves. It’s essential to make typography readable, understandable, and legible. Typography should honor the content in a way that never adds to the user’s cognitive load. Do you have your own tips on typography in web design? Or you want more details about the points mentioned above? Let me know in the comment section below!